1898 Delivered to William Watkins, London. 1900 Transferred to William Jr. & John S. Watkins. 1901 Census position 10m SE of Lizard. 1903 Reboilered. 19-11-1911 Towed SS Sussex [5600grt] off Tongue Sand. 1914 Transferred to John S. & Alfred Watkins. 1915 Assisted SS Sarpen, aground at Papa Strousay in the Orkney Isles. This led to a case in the Admiralty Court as to whether she could claim salvage, being under Admiralty control at the time. 1917 Owners restyled William Watkins Ltd.
1924 Mast shattered by lightning whilst berthed at Ramsgate. 1928 Assisted beaching liner Carmarthenshire at Erith and fighting oil bunker fire on liner. 1940 Worked at Dover throughout Dunkirk operation under Master G Lowe, assisting over 140 vessels berthing and leaving the harbour. Based at Dover for over four years. 1940 Towed bomb damaged SS Mona's Isle into Dover. 1940 Together with Dover tug Lady Brassey refloated destroyer Montrose and towed her stern first to Dover from Cape Gris Nez after the destroyers bows were blown off. Later towed bombed destroyer Jaguar into Dover. 1940 With Gondia towed damaged sloop Bideford into Dover. 1940 Damaged by bomb near-miss in Dover Harbour. 1943 Returned to Watkins.1944 Returned to Thames prior to D-Day. 1944 Assisted towing Phoenix unit A2-68 ex South West India Dock to Tilbury. 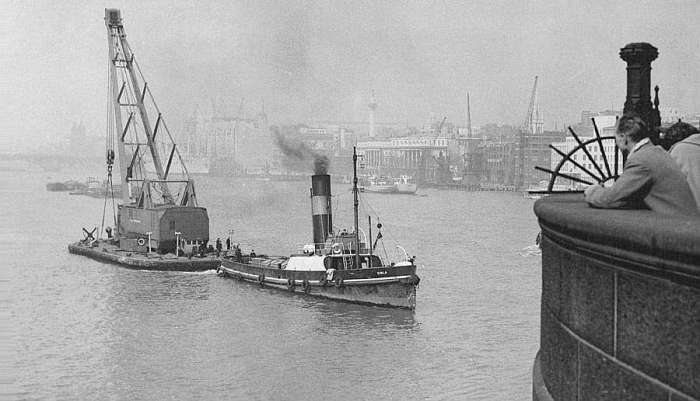 1950 Ship Towage [London] Ltd appointed managers. 1964 Scrapped by Medway Drydock and Engineering Co., Sheerness.